Eid Mubarak to all... Semoga syawal kali ini membawa seribu erti khususnya dalam perjalanan kita mencari redha Allah s.w.t... ameen! pregnant.. sebelum ni x de pon beraya n pregnant...haha! 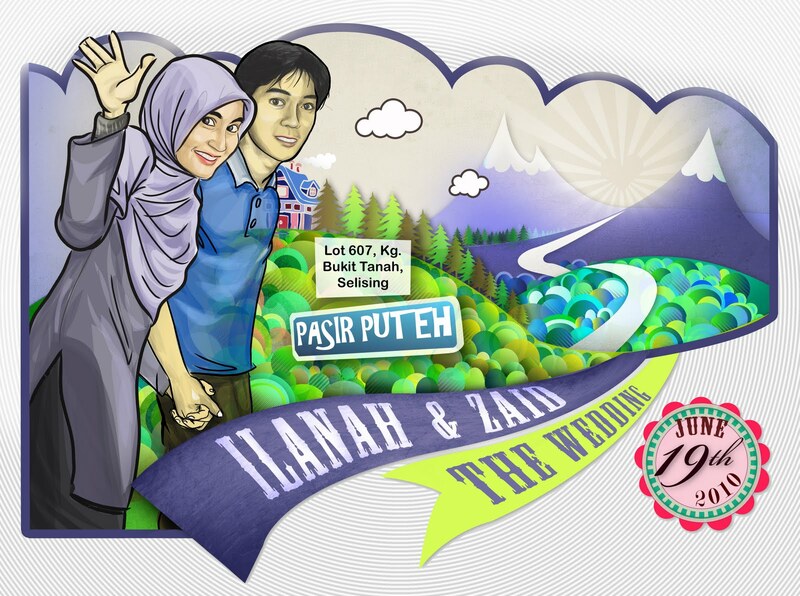 luar dari Malaysia... (dah la tanpa family,.. huu) tp pengalaman beraya di new zealand sangat berharga! apa2 pun... memang raya ni tetap best walaupun bersedih (terutamanya kerana Ramadhan yang tidak dimanfaatkan sepenuhnya..)... Pagi2, bersiap untuk solat raya, kena naik bus baru sampai... masjid jauhhhh... kalau kat Malaysia masjid ke surau ke.. semua walking distance..
Sampai masjid... MasyaAllah! Penuh!! dewan utama (muslimin n muslimat) penuh dengan muslimin sahaja... muslimat kena guna dewan serbaguna... dan saya selaku orang yang lambat.. solat di dewan makan2... tak pe..asal solat raya! Yang bestnya, time solat sme cam jeling kiri kanan...since lupa step2 solat especially part takbir tu... ngaa... biasalah, dah solat raya setahun sekali.... Khutbah raya sngat bersemangat tp sayup2 je dengar..since ramai lagi yang seronok2 bercakap (ye la... maybe jumpa pon sekali setahun..bila da jumpe berborak sakan la...). ini cerita 1st day raya, habis di rumah hazim kitorang sme balik ke rumah masing2... Esokkannya, kitorg bercuti, dok umah je..tggu org datang rumah.. seb beq ade rendang Haq... kitorg x keluar shopping pon untuk prepare open house.. masak ape yang ade..and ala kadar... yang penting ukhwah n silaturrahim mesti di bina.. kann??? Guess what?? I AM PREGNANT! and now it's almost 11th week of pregnancy...am still may not look pregnant to onlookers and that makes me a little bit frustrated. 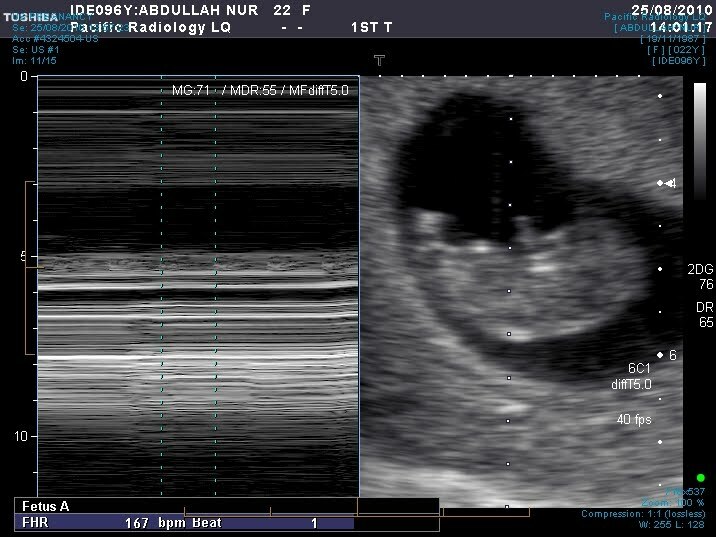 However, being pregnant at a very young age is a bless from Allah s.w.t, am now 23 years old and i'll become a mother at the age of 24...InsyaAllah! And on top of that, my parent will have more grandchildren..and more later... :D My little one will become their 18th grandchildren and that's for sure will bring a lot more fun and endless happiness to all.I've been married for 79 days now and we are both happy and our little one will strenghten our love..insyaAllah. 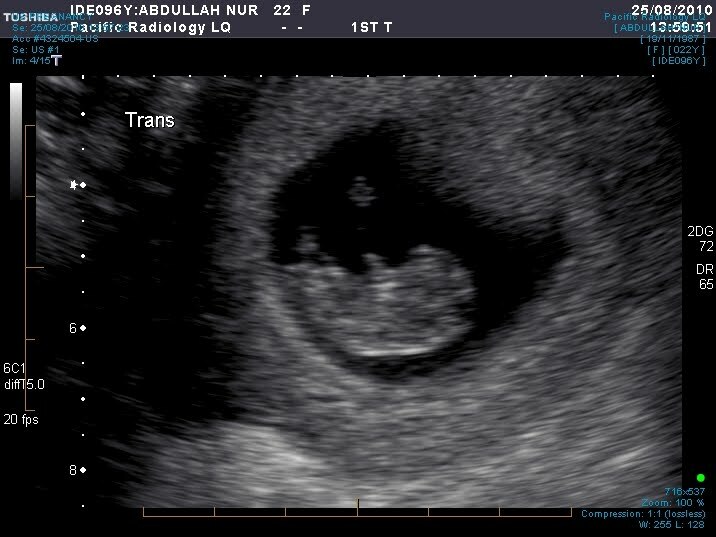 About a week ago, I had an appointment for an ultrasound procedure which cost a lot of money. My husband accompanied me to the Pacific Radiology Centre and it's just 5-10 minutes away from home. That's my 2nd appointment after previous consultation with the doctor. And I had to pay almost 90 NZD just for 20 minutes consultation, which at the end only prescribed 0.8 mg Folic Acid supplement, handouts/flyers on pregnancy, and futher procesures to follow. I'm started to feel lucky to be Malaysian, which I think you only have to pay RM1 for all. Ok, now back to the Ultrasound procedure, although it's veeeery eexpensive but i think it's worthful. The procedure confirmed that my pregnancy already at 9th week by measuring the foetus size(not sure how they do that though..). The wonderful thing is.. i saw the 'tiny guy' inside my womb is kicking and punching, and that makes me burst into tear. 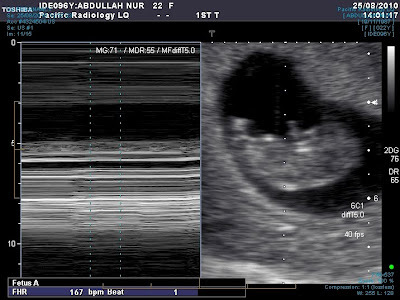 It's just soooo lovely and you can always say 'SubhanAllah' every time you see it... here is some pictures that i wanna share..
You may wanna now... How big the little guy in this picture.. based on the ultrasound procedure.. the foetus was 28 mm long (that's about an inch) or about the size of a large grape. And weighs less than one ounce at, but will soon start putting on weight dramatically later on. And now, our little one is growing larger and larger as the pregnancy continues week by week. By pregnancy week 11 our baby should be big enough to hold in the palm of our hand which about 1.6 inches long and weighs almost .25 of an ounce. We could see right through the skin. Our baby's skin will remain paper thin, but soon it will become a multi-layered membrane and lose much of its transparency. By this point in time, our little one should be able to open and close his or her fists, and little buds are forming in his or her mouth that will eventually develop into teeth! By pregnancy 11 weeks, our baby's fingers and toes have lost their amphibious-like resemblance, now they are separated instead of webbed. Our little one is taking advantage of the huge space she is floating in by kicking and squirming about. Just by knowing this fact i felt blessed! I ever had blood vomiting as the consequence of forceful vomitting. And it;s not a pleasant experience to tell, I ate a lot that night due to Break Fast invitation (of course i had multiple meal at that time!). There's something stuck in my throat that made me coughed and strained the blood vein which caused the blood to burst out. The undescribable throat pain cames after i vomitted all the foods in my stomach, the saliva production increase and am hardly swallowed. It;s painful and it took me two days to get my throat back to normal. Fasting while pregnant is a very adventurous journey of mine... especially for the 1st timer like me. Some mention that 20-30th week of pregnancy is the best for fasting, and am fasting during 1st trimester. It's ok to fast if it's not harmful to the baby and the mother, and alhamdulillah am managed to fast till now. However, I hadn't fast for 4 days (1 day due to Ultrasound, 1 day after blood vomitting, 2 days of intolerable fatigueness) which I have to replace it after Ramadan. I think that's it for now.... a lot more will come.. insyaAllah! hope this ramadan would be better than last ramadan... ameen! 1) Anas reported God's messenger as saying, "When a woman observes the five times of prayer, fasts during Ramadan, preserves her chastity and obeys her husband, she may enter by any of the gates of paradise she wishes (in other words nothing will prevent her from entering paradise)." [Mishkat]. MasyaAllah... it's sounds easy for woman to enter jannah/ heaven.. but yet! why there's more women than men in the burning hell? O' Allah.. let me be a good & obedient wife...let me die when my husband pleased with me at most...& we really want your blessings to guide us to what You like most! Ameen ya Rabb! Sahabat-sahabat di jemput hadir ke Majlis Perkahwinan di antara Nur Ilanah Abdullah & Zaid Mohammad Nor. Kehadiran & Doa Restu dari para hadirin saya dahului dengan ucapan terima kasih. Kepada sahabat2 yang sanggup mempertaruhkan masa, harta dan mungkin jiwa untuk menghadirkan diri di majlis ini, saya alu-alukan dan berbesar hati. Mungkin untuk sahabat yang diluar kelantan sukar mengenalpasti alamat rumah, saya sarankan sahabat2 menghubungi saya seawal mungkin untuk 'konsultasi'...hehe! kelewatan mungkin mengakibatkan ketidaklayanan..ngee! Akhir kata, sahabat2 datanglah beramai2 untuk memeriahkan majlis. Moga dengan kehadiran kalian bertambahlah keberkahan majlis ini.. InsyaAllah! when it comes to learning process.. some of our mind pictures the book out of anything else.... for students, parents and even whole society.. should start making the transitional views of this... i always remember that our primary school and even secondary school teachers reminds us to read books when its holiday... well..it's an established effort..
at some point.. we always thought only being a bookworm can make us bright... ngee! not always.. 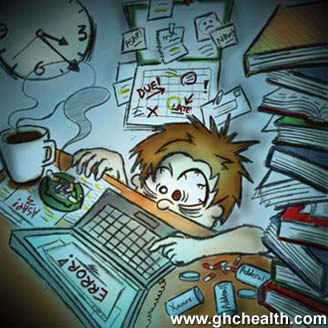 Some how.. being a Dietetics student.. I don't think I just need to limit my knowledges within the dietetics and nutrition fields.. Other knowledges might needed whether indirectly or directly.. I made a lot of thinking about myself in 23 years.. and to be more precise ‘22 years 3 months and 17 days’… Have you ever asked yourself on how good you are in your living… what’s your achievement.. what is actually you gained in so many years of life.. all this while.. is it worthwhile? Or is it full of misery? and to be more relevant.. did I or did us… ever asked whether we able to set our ‘foot’ in heaven with all the good and bad things we have done before? So many questions coming out of my head and it made my hairs stand… but I have to move on and find the answers… It’s seems like I’m in a race to unlock a code.. or maybe to untie the tightened ropes… it’s not a piece of cake anymore…. I don’t know the answer too.. but I’m so sure about what I should do… or at least I try to do… First, I have to think deeply and put myself in the ‘reflection room’.. and for me.. I prefer to think about myself and reflect on my deeds while sitting on the praying mat after night prayer (I’m feel sorry to myself.. coz I rarely do it..). Life as a garden where we can plant good or bad crops which we can harvest later …in the Day of Judgment…. World is a big stage… where we are the protagonist.. and it is our choice to perform good or bad play…. Today is better than yesterday.. The title above seems so hard to be true... at least for me.. I feel so bad about my own blog and at the same time... i feel a bit relief that i'm still able to write a post today... at least i can put my 'junks' here... ngee! you may think i'm exaggerting... but that's how i feel... & people always be different in any sense.. In conclusion, so many negative thing will be when our weak soul enfeebled our mental & physical health! To keep our performances either mentally or physically keep in escalating trend... don't you think we should be able to keep our soul strong and healthy as well..
is a wife to Zaid Mohd Nor, a mother-to-be .. & the most important thing is I AM A MUSLIM!! “Telunjuk yang bersyahadah setiap kali bersolat bahawa Tiada Ilah yang disembah dengan sesungguhnya melainkan Allah dan Muhamad Rasulullah, tidak akan aku menulis satu perkataan yang hina. Jika aku dipenjara kerana benar aku redha. Jika aku dipenjara secara batil, aku tidak akan menuntut rahmat daripada kebatilan”. You are straightforward, honest, and real. You believe it's important to be yourself, even if you shock people. You are worldly and well traveled. You have seen a lot in your life, and it's hard to rattle your cage. You tend to embrace a laid back, "anything goes" attitude. You wouldn't ever think to judge someone. You believe that it's important to seize the day and live like there's no tomorrow. You can get along with anyone who agrees. Your purpose in life is to lead others. You have great drive and determination. Nothing is going to stand in your way. You seek out challenges and the spotlight. You'll take all the work - and all the glory. Status and success are important to you. You demand the best from everyone and everything. In love, you tend to take a protective role. You enjoy being the provider in relationships. You expect others to be like you, and as a result, you are often disappointed. A little selfish and vain, you always put yourself first. Remember, everyone already knows you're great - you don't need to remind them! You are very insightful and tend to make decisions based on your insights. You focus on how things should be - even if you haven't worked out the details. An idealist, thinking of the future helps you guide your path. You tend to give others long-term direction and momentum. You are practical, sharp, and very intuitive. Optimistic and energetic, you are a problem solver who doesn't get discouraged easily. You are also quite compassionate and caring. You make people feel hopeful. You're highly adaptable and capable. You do well with almost any curve ball life throws at you. You do best when you: - Are always learning new subjects - Use your knowledge to solve problems You would also be a good therapist or detective. Balanced and calm, you have mastered the philosophy of living well. You're very open and cheerful - and you feel like you have a lot of freedom in life. Your future may hold any number of exciting things, and you're ready for all of them! You seem cool and collected, though a bit shy. You are highly driven and a perfectionist, but that's a side you keep to yourself. Creative and artistic, you are a very unique person who doesn't quite fit in. People accept you more than you realize, seeing you as trustworthy and loyal. You are an amazing friend. Anyone who has you as a friend is incredibly lucky. And judging by how many friends you have, there are many lucky people in this world! You can talk to people easily, and you often turn strangers into friends. You are also a good listener. You are there for your friends when they need to vent, without judgment. Overall, you have a genuine interest in people and their lives. And your friends can tell. Taking time for your friends is very important to you. And because of this, you have lots of deep and meaningful friendships. If we had to guess, we would guess that you are a man. You use the internet to make your life more efficient - and to make you smarter. For you, the internet is like a vast encyclopedia. You search and surf extensively. You look up everything online. Do You Use the Internet Like a Man or a Woman? "And whomsoever Allâh wills to guide, He opens his breast to Islâm, and whomsoever He wills to send astray, He makes his breast closed and constricted, as if he is climbing up to the sky. Thus Allâh puts the wrath on those who believe not. "